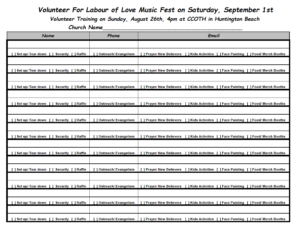 Our 7th Annual Labour of Love Music Fest will be held on Saturday, August 31st, and we would like to invite you to participate. This is a Free Community Event where people can enjoy great contemporary, live, Christian music, delicious food, raffle giveaways, children’s rides and activities and approximately 100 businesses providing goods and services in our vendor market place. Most importantly, a presentation of the life-changing, Gospel message. Furthermore, the Air Force will be performing a fly-by following the National Anthem. In addition, the Marine Corps Color Guard and City and County Officials will participate in our opening ceremony. Last year, our event was a great success with an estimated 10,000 attendees throughout the day. Even more are expected to attend this year, which means more souls that can be introduced to Christ. Our vision first began with a small concert on a local green belt, but God granted us favor with the Bolsa Chica State Beach authorities allowing us access to their northern most parking lot for the venue—a two football field-sized space! We did not think we could possibly use the entire lot, but God filled the space and thousands of people came. We are amazed at how God has blessed and grown this outreach to something larger and more impactful than we ever imagined. Hundreds of people have responded to the gospel message and many were provided free bibles, counseling, prayer, and were baptized at the beach following the concert. God is stretching us outside our small congregation, to partner with other churches and groups to continue to make this event a success as it grows each year. If you would like to be a part of this vision of the gospel going forth in a powerful way through our Labour of Love Music Fest, then we would like to give you the opportunity to be involved by becoming a LOL Partner. LOL Partners can participate in several ways. First, by showing our Promo Video, passing out promotional postcards and asking your group to come to the event with their unsaved friends and family. Second, by playing our Volunteer Video and announcing there are numerous opportunities to volunteer. They can serve in our set up and tear down crews, security, outreach and evangelism, prayer and follow up teams, kid’s activities or band merchandise booths. 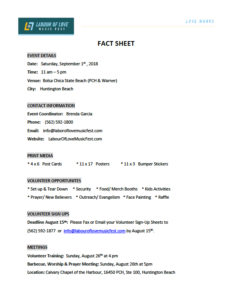 We have sign-up sheets as well for your volunteers to fill out to participate. Please return them to us, by August 9th, so we can get your volunteers in touch with their leaders. Fourth, we also ask that you partner with us in prayer for the event. Please pray for all the volunteers, local businesses and musical artists that make this event happen, as well as the gospel going forth and that many souls will commit their lives to Christ. Please join us as we reach out to our community in His love. 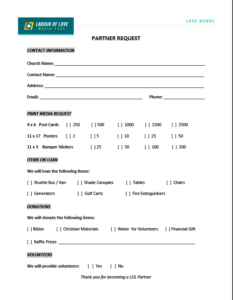 If you are interested in joining us as we reach out to our community in His love, please fill out and return the LOL Partner Request below, noting your level of involvement and print media needs, to info@labouroflovemusicfest.com or FAX (562) 592-1877. We will follow up with you after receipt. Blessings! in that you have ministered to the saints, and do minister.